You're looking at the top of the door frame which Dave began stripping the paint from earlier this week. If you look carefully you can see horizontal tracks running across it and rather than having a nice crisp door frame shape, the whole thing is rather crumbly. We're thinking woodworm. Ancient woodworm, which was probably there before the many, many layers of paint were applied directly over the top, covering the exit holes the adult beetles would have escaped through. Oddly, the woodworm only seems to have affected a four foot section of the upright and only certain bits of it, leaving the majority of the frame untouched. I've contacted our usual handyman who in turn has put out a call to his woodworking mate... we're waiting on a visit for a verdict, but I suspect that we'll need to replace the entire frame. Can you hear me sighing? In other news, there has been some very slow crafting going on. 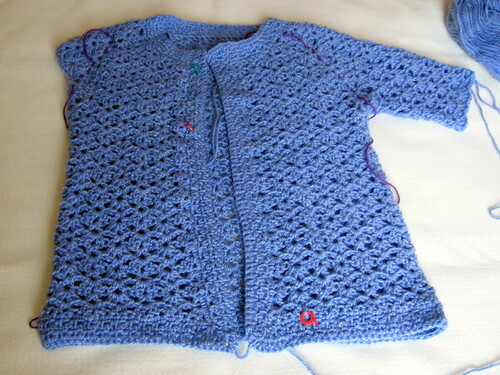 For example, I'm close to finishing this cardigan. This is my version of Doris Chan's Cinnabar cardigan, which has been waiting for sleeves for the past couple of weeks. I've added button holes to the top (hence the markers) of the band running up the front, so I'm hoping it will work as a maternity cardi rather than having to wait until I return to my more usual dimensions before I can wear it. Naturally, since I need to concentrate on making sleeves... I cast on a sock. These are intended to be something pretty for me and are plain socks, knit up in Wendy Happy, which is bamboo with the usual 25% nylon you'd expect in a sock yarn. 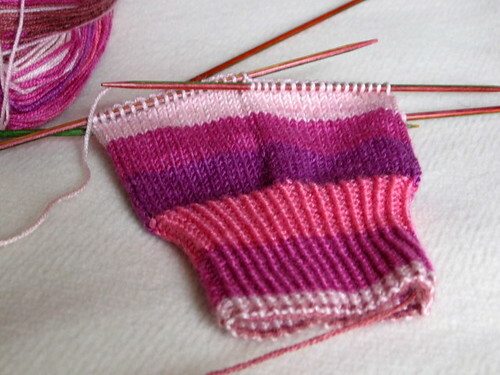 So far I'm enjoying knitting this first sock, watching the colours play out is captivating me in the usual way and not having to really think about the pattern is a serious bonus. So who knows, maybe I'll get it finished fairly quickly?